Some 70 or 80% of the tourists on Boracay come from other Asian counties, such as China, Taiwan and Korea. Only the remaining 20 to 30% come from european countries and the US. While the Asian tourists might have direct flights to Kalibo, most european people will end up in Manila or Cebu and have to buy another plane ticket to Boracay. Now, when you use the known booking machines in the internet and put Boracay directly as the final destination from your home country, you will be presented with rather expensive tickets, including the connection flight to Boracay. If you use Manila as the final destination, however and book the connection flight to Boracay separately, the tickets are much cheaper. From Europe to Manila, you can easily find tickets from 600 to 800 Euro, the connection flight to Boracay should cost no more than 50 Euros, one way. Reasonably priced international tickets from Europe to Manila are available at most airlines from the Middle East, such as Emirates, Gulf Air, Qatar Airlines, Etihad or Saudi Arabian Airlines. Look out for some special offers! The connection flight from Manila or Cebu to Boracay Airport, you can book directly on the web sites of the philippine domestic airlines: Philippine Airlines, Cebu Pacific Air and Air Asia. 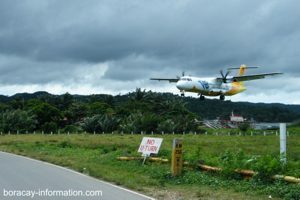 Flights from Manila to Boracay Airport depart about every 30 minutes during daytime, from Cebu to Boracay, there are only three or four flights a day. Please note, that in case of bad weather, the small planes can not land at Boracay airport and will be diverted to Kalibo.